Pin It Now! My sweet, little baby girl is asking for me to do school with her. I honestly wasn't planning on starting anything "formal" with her until August. But, she's asking, so what's a mom to do? Of course, start "school"!! www.first-school.ws to the rescue!!!! 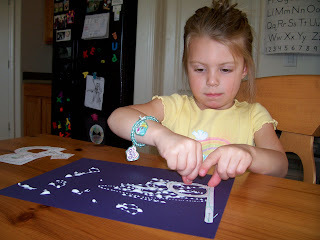 Need to dig out my Abeka pre-school stuff, too. 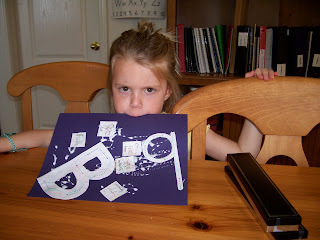 Getting ready to glue the letter "Bb" to her blue paper. 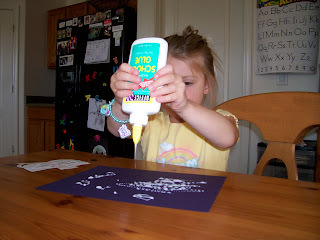 Can't tell, but she did color the letters first, along with some little pictures of things that start with B.
I started school with Mullin much earlier, but I had the time back then. Same with Lincoln. Really, I don 't think Mullin or Lincoln were any more ahead when they were at the age Shiloh is now. Somehow, when I have had spare moments, I have managed to teach her the alphabet, counting to 10 or so, and Dora is teaching her Spanish. We read tons of books and she can't help but hear some of what the boys are learning. Not to mention Clifford the Big Red Dog computer game is also helping out a bit. She is definitely not behind or anything! !